I made this cake for my Nephew’s 4th birthday. I took a picture that I liked and blew it up to the cake size that I wanted and then cut it out. I baked and leveled my sheet cake big enough for my paper cut out to fit on. I then cut out the shape of the cake going around my paper cut out with a sharp knife. I used a toothpick to draw lines on the cake as guides so that I would know where to put what color. I like to use a buttercream frosting because it smooths out great with a warm pallet knife (dip it in warm water wipe water off and while it is warm smooth the surface of cake and keep repeating process until cake is finished). I used gum-paste to make the rope, I rolled it out and cut it to size and then let it dry (gum-paste dries fairly fast) and then I painted with Wilton’s food color the lines of the rope. I used fondant for his face, I colored the fondant skin color I wanted and then cut out the shape of his face. While I had my cut out piece of face on top of the fondant I used a pencil to go over the lines of his face (mouth, nose, eyes etc) to created a slight indention on the fondant that I could later go back and paint with food color the markings on the face. 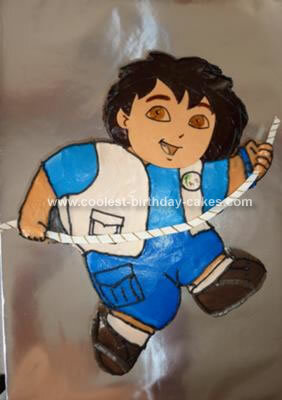 Once the homemade Go Diego 4th birthday cake was decorated with the butter cream I put the rope in position and positioned the face. you did a great job, thank you for the instruction.